Our Mission: To lead the Construction & Land Development Industry in outstanding service and high quality performance with attention to safety and responsibility. RAM-T Corporation is committed to pursuing and maintaining loyal and mutually beneficial relationships through clear expectations, strong communication and delivering results exceeding those expectations. We began in 1984 and for the past 30 years have delivered superior service and exceptional results. We are a WBE Distributor for woven and non woven geo textiles for filtration, drainage, erosion control, reinforcement purposes. 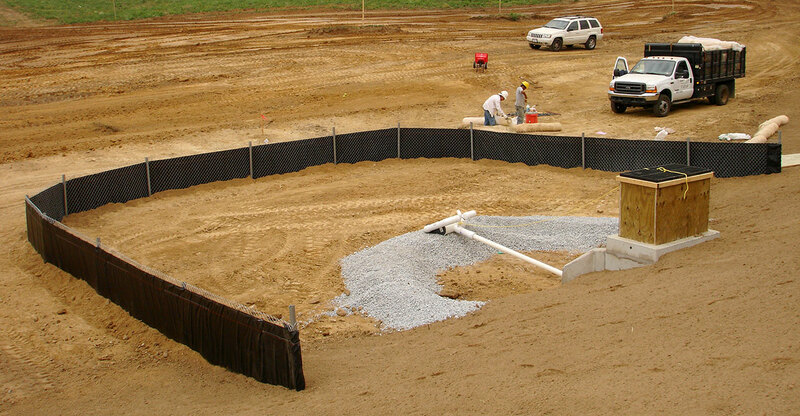 Supply and Install all Erosion and Sedimentation Products to include all Seeding and Sodding, Silt Fences, Super Silt Fences, Baffle Walls constructed of Marine Grade Plywood and Super Silt Fence Baffles, Silt Socks of all types including Filtrexx sock. 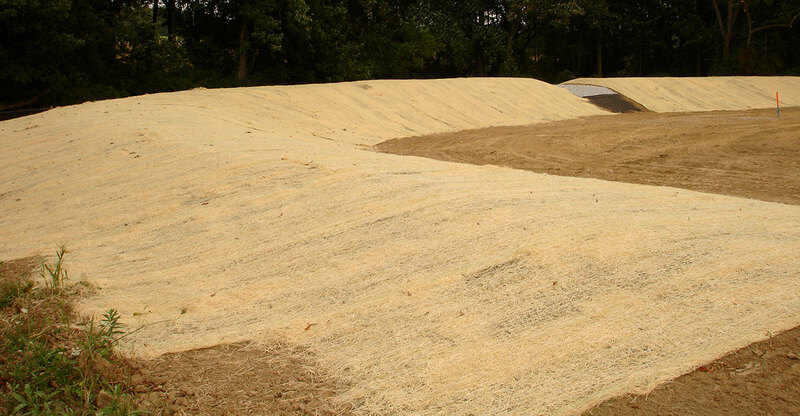 Stabilization Services including Hydro-Seeding, Dry Mechanical Seeding, Straw Mulching. Ram-t has expertise in the installation of new Lawns and Ball Fields. We specialize in the Rejuvenation of all Lawns and Field types. Ram-T also installs Straw and Excelsior Temporary Blankets as well as Permanent Blankets to include North American, East Coast, American Excelsior Products and more. All Re-vegetation and Storm Water Management Structures and Products such as Earthen Walls, Gabion Structures, Geoweb, Monoslabs, Grassypave Products and Checkerblock Systems and Articulating Block etc. See Erosion and Sedimentation section for more details. See Gallery for Photos. Landscape Design and Install for Residential, Commercial and Public Projects, Maintenance and Clean-Ups, Wetland Mitigation and Reporting, Rain Gardens, Boulder Walls. See Landscape section for more. Outdoor Living Spaces, Outdoor Kitchens, Granite Countertops, Gazebos and Fireplaces, Patios, Steps, Walkways and Walls and Water Features. See Construction for more. Ram-T Corporation supplies and installs Soil Blends per specification for your private and public project needs. We also make our own Mulch Products. 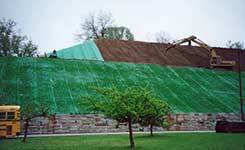 Ram-T is a certified supplier of Filtrex mulch. We are a Certified Regular Dealer for Penn Dot, Del Dot and New Jersey Dot. RAM-T Corporation travels far distances to satisfy our customer’s needs. Our professional services extend throughout Pennsylvania, New Jersey, Delaware, Maryland, Virginia and New York. Ram-T is on a Commercial Site from the First Day of the Project with the installation of Erosion Control Devices, During the Project with Seeding, Landscape and Hardscape Installations to the Completion of the Project performing Punch list and Maintenance Operations. We are accustomed to working with General Contractors, Owner’s Representatives, Architects, Engineers and Inspectors to help turn over a Quality Project to the Owner. We have performed work for Commercial Owners like Lowe’s, Home Depot, Walmart, and Wawa to name a few. RAM-T has a large infrastructure and is capable of performing on projects up to 10 million dollars. Ram-T is well versed in Geotechnical Installations and Reforestation Operations. With over 30 years experience as an industry leader, RAM-T has built a reputation for high quality installation and service second to none. RAM-T specializes in high end residential landscapes. 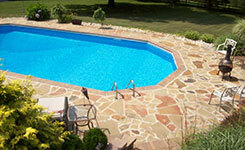 From ponds, waterfalls, and fountains to fire pits, decorative outdoor fireplaces, seat walls and paver patios. Creating an outdoor living space is the way to go. 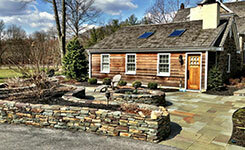 It is a fact that Landscape and Hardscape is the #1 return on investment above kitchen and bath improvements. Our expert design team will consult with you, and compliment your ideas with their expertise to design an elegant solution to your outdoor desires. Single High End Residential Projects to Homes in Large Tract Developments for Builders and Home Owners and Developers. Ram-T is a Penn Dot and Department of General Services Pre-qualified Subcontractor. We are also a Certified WBE firm qualified to perform work on projects involving Septa, The City of Philadelphia, The Federal Hwy Administration, The Federal Aviation Administration and various Railway Entities including CSX and Norfolk Southern. Ram-T Corporation is also a certified WBE in the State of New Jersey. We are certified to perform work on Penn Dot, New Jersey Dot and Del Dot Highway projects. Our WBE Certification also qualifies us to perform on Federal Transportation and HUD Projects. Contact us for a full list of products.